Join Rocky Mountain Dance Floors and other local wedding vendors for the wedding show on Saturday, December 9, 2017 at the Lodge at Mountaineer Square from 3:00 - 5:00 pm. 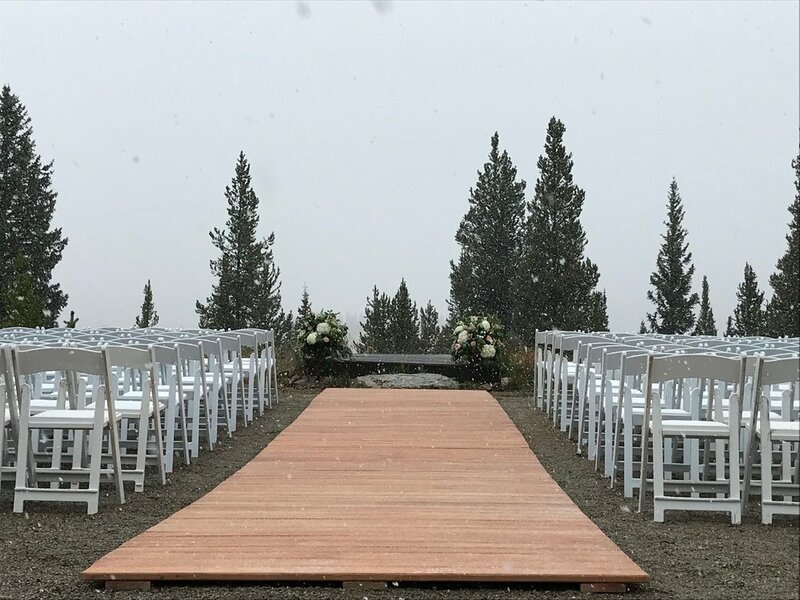 Rocky Mountain Dance Floors set up their portable wedding aisle for a beautiful Fall ceremony. "Soul Train" Night was a huge success! Soul Train 2017 was surely one for the books and Rocky Mountain Dance Floors was thrilled to be a part of it. KBUT Community Radio sold over 1,000 tickets at $20 a piece which is by far the most tickets ever sold in the 20+ year history of Crested Butte's biggest dance party of the year! We'd like to thank KBUT Radio, High Mountain DJ's, the Elevation Hotel and Spa, and VRCinematic for letting us use Soul Train as our debut event for the new LED dance floor. Our LED dance floor was a huge hit with everyone and may now be a Soul Train staple. We were extremely happy with the floor's performance and we figured that if it could survive KBUT's Soul Train night, it could survive anything and it passed with flying colors! From the moment the music started at 8pm until when it stopped at 1am, the LED floor was packed with locals dressed in their best disco attire. KBUT's Soul Train Night is our public radio station's longest-running special event and is an important fundraiser as well. Since the early days of the station, year after year crowds from throughout the Gunnison Valley come decked out in their grooviest digs to dance, party and crown a new King and Queen of Soul! A true Crested Butte/Gunnison tradition, Soul Train Night is the premiere dance party of the entire year and is a must-attend event. Rocky Mountain Dance Floors are thrilled to be donating our electronic LED dance floor to the cause to make this disco party official! It will be the floor's debut and we're very thankful to Laura Silva and KBUT for letting us in on the fun. The event is Friday, March 31st at the Elevation Hotel on Mt. Crested Butte in the lower lobby from 8pm-1am (21+). Tickets are $20 and can be purchased in advance at www.kbut.org. We hope to see you there and groove on! Amongst the deep depths of the snow here in Crested Butte and the Gunnison Valley it's hard to imagine come mid June it will all be gone and the wedding season will be in full swing. It seems so far away, but as we know time flies and Crested Butte's long summer days of hiking, biking, camping, and fishing will be here before we know it! Rocky Mountain Dance Floors was recently a part of the "Un-Bridal" show at the Steam Plant Event Center in Salida, Colorado. The event was wonderfully put on by the Heart of the Rockies Wedding Association and we are thankful to have been a part of it. Unlike most bridal shows where there are endless rows of booths lined up one after another, this particular wedding show was set up as if it were your wedding so the newlyweds could see each vendor shine in the space and gain a better understanding of what they are about. Don Peterson with Shavano Soundz had his DJ booth on a stage and we were able to set up our floors in front of the music. This provided the perfect environment to pitch our new dance floor rental company! Rancho Verde Flowers had beautiful arrangements atop Settings Event Rental's rustic furniture that complimented each other nicely. The event was a big success and the newlywed turnout was very good and much better than last year we heard! There was a great mix of vendors and you could find whatever you needed at the 2017 "Un-Bridal" show. It was the perfect way to kick off the 2017 wedding planning season. Rocky Mountain Dance Floors is currently booking dates for the 2017 wedding season. Serving Gunnison, Crested Butte and the rest of the Western Slope of Colorado. Please contact us at www.rockymountaindancefloors@gmail.com for your free custom quote. Greetings from Crested Butte! My wife and I are excited to launch our new business, Rocky Mountain Dance Floors! Our company is based out of the Gunnison Valley and it is our mission to provide a quality experience while offering a variety of high quality dance floor rentals to the entire Western Slope of Colorado. The idea came to mind after my years of performing weddings and events with our band Doctor Robert, The Beatles Tribute. I noticed that from event to event there seemed to be the same old boring dance floor with that run down Oak Parquet finish. The floors were just a side thought to the big event rental companies, they clashed with the décor, weren't always set up correctly, and many times did not look clean. After some thorough market research, we decided to open Rocky Mountain Dance Floors in November of 2016 to address those issues, offer more floor options, and to work together with event and wedding planners to provide an all around flawless occasion. Our company has a variety of extra sturdy, unique wood floor finishes to perfectly accentuate any theme and we're thrilled to also offer our electronic LED dance floor! These floors can be set up both indoor and outdoors in different sizes and configurations. We're excited for our new adventure and hope you consider us for your event. We invite any and all to browse our website at www.rockymountaindancefloors.com where you can find more information, photos, ect.